The Daily Independent (Kannapolis, NC), 5 Apr 1968, p. 1. 50 years ago, Rev. Martin Luther King Jr. was originally scheduled to tour North Carolina while campaigning for Reginald Hawkins, a Charlotte dentist who was the first serious black candidate for governor in a North Carolina Democratic Party primary. King was instead diverted to Memphis, Tenn. in support of a strike by sanitation workers. It was a time when issues regarding civil, labor, and voting rights, which had long plagued the African American community, caused tensions to run high. After his death by an assassin's bullet at the Lorraine Hotel on Thursday, April 4, 1968, frustration and anger resulted in violence in many cities across the country. What was the reaction in Cabarrus County the week following the tragedy? On the morning of April 5, it was reported that all ABC liquor stores in Concord and Mt. Pleasant were closed on the order of North Carolina Governor Dan K. Moore. He also stopped the sale of beer, wine, and all other alcoholic beverages. The governor prohibited sales of alcohol throughout the state until further notice due to concern about reports of violence in Raleigh, Charlotte, and elsewhere the previous evening. 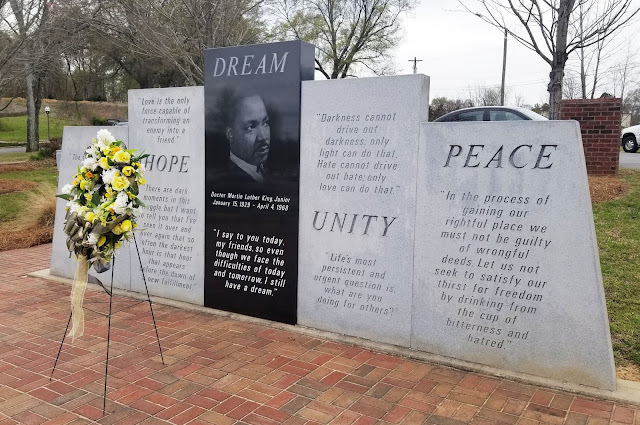 Students at Concord's traditionally African American Barber-Scotia College held a closed campus memorial service on April 5 honoring the assassinated civil rights leader. Dr. Jerome Gresham, president of the college, acknowledged that people were expressing their grief in many ways, but condemned the violent expressions that Dr. King himself denounced. Some took a hard line, such as Robert Vance Somers, a Republican candidate for the U. S. Senate, who spoke at the Hotel Concord on Saturday, April 6. Somers lashed out at the rioting and said that, "anybody caught throwing a molotov cocktail into another man's business should be shot." On Sunday, April 7, ministers in numerous churches made an appeal for calm and peace while commending Dr. King's efforts on behalf of the black race. Some warned of the ramifications of creating a war in the streets while still fighting the war in Vietnam. The students of Barber-Scotia College invited the public to an open memorial service at the campus quadrangle on Monday, April 8. The invitation was extended to Mrs. King and her family, President Lyndon Johnson, and other high ranking government officials, along with letters written by the students in a bound volume. The service attracted a large crowd. Afterward, about 30 students walked to the Concord business district without incident. As waves of violence continued in many cities, Concord Mayor S. Les Myers, citing concern about outside infiltrators, followed Charlotte's lead by enforcing a city-wide curfew from 8 p.m. to 5:30 a.m. on Monday, Tuesday, and Wednesday. Violation of the curfew was punishable by a fine of $50 and imprisonment up to 30 days. Likewise, the Cabarrus County Commissioners adopted an ordinance that made it possible to declare a county-wide curfew if warranted by a state of emergency. Myers was pleased with the cooperation from Concord citizens and reported only minor incidents of vandalism and curfew violations. As the weekend approached, racial calm returned over most of the nation, ABC liquor stores reopened in North Carolina, and the Concord curfew was lifted. News turned to Sunday's Easter sunrise services and registration for the upcoming election primaries. Today, the monument in Concord's MLK Memorial Plaza not only honors the life and legacy of Dr. King, it is a reminder to the citizens of Cabarrus County to preserve the dream of truth, hope, unity, and peace. MLK Memorial Plaza, Concord, NC, 4 Apr 2018.